According to the Marxist sociologist Pierre Bourdieu, middle class parents possess more cultural capital, than working class children. Bourdieu argues that the skills and knowledge middle class parents possess, such as themselves having benefited from education, and the fact that they are more comfortable dealing with middle class institutions such as schools, is passed down to their children, which explains why they do better in school. Point 1 – More cultural capital means middle class parents are better educated than working class parents and they are more able to help children with homework and coursework. Analysis 2 – This advantages middle class children early on in their school careers by boosting confidence. This early advantage accumulates over time and develops through school. Point 2 – Cultural Capital also means middle class parents are skilled choosers – They are more able to research schools, take time filling in application forms, and networking with teachers to give their child more chance of getting into the best schools – Stephen Ball found this. Analysis 1– The opposite of this is working class parents who are disconnected choosers, they don’t have the skills to complete large amounts of applications and so just send their children to the local school. 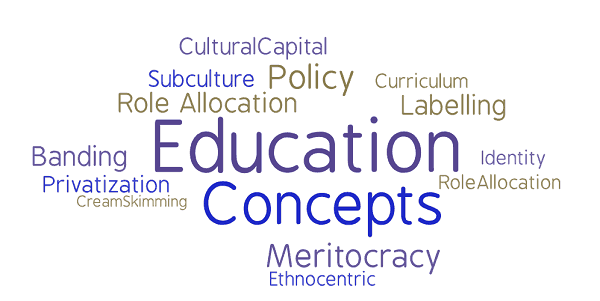 Analysis 2 – This aspect of cultural capital has become more significant since the introduction of the 1988 education act which introduced marketization and parentocracy and gave parents’ choice over schools. Analysis 3 – This means that the system has changed recently to allow those with more cultural capital to have even more of an advantage. Globalisation, or the increasing interconnectedness of countries across the globe, creates both challenges and opportunities for the United Kingdom. For example, economic globalisation has resulted in both more opportunities abroad and more competition for jobs for these jobs; and increasing migration has resulted in greater multiculturalism in the UK. Education has had to adapt to globalization, and as a result, pupils today experience education very differently to previous generations. Point 1 – Economic globalisation means increased competition from abroad, which means British students today are expected to spend longer in education (as evidence by the increasing of the school leaving age. So one change in the experience of education is that students stay in school for longer. Development – globalisation has meant that most of the unskilled factory jobs have now moved abroad, and increasingly British workers need to be better educated in order to get jobs at all, thus the expansion of higher education means that more students ‘experience’ higher education and are better qualified than their parents. Further development – however, ironically, poorer UK students are put off by the fees universities now charge, meaning that the globalisation of HE is possibly resulting in more class inequality. Further development – increased competition also means more pressure to succeed, schools are now ranked by PISA league tables, which means even more ‘teaching the test’ and ‘narrowing of the curriculum’, which is a final way the experience of education has changed. Point 2 – The item also refers to the pressures of increased immigration resulting in more multiculturalism – and British schools have long had multicultural education in response to this, which also changes pupils’ experiences of education. Development 1 – For example, religious education has long taught about other religions, and increasingly schools and colleges have events such as ‘black history month’ raising awareness of diversity. Further Development – schools have also introduced compensatory education to help recent immigrants from Eastern Europe, such as extra support for pupils who don’t have English as a first language. Further development – however, some policies may be seen as potentially divisive, for example, the prevent agenda in schools seems to target Muslim pupils through ‘categorical suspicion’. Further development – There is also doubt that these inclusive policies are working, many people, especially in working class areas, object to the extra resources being spent on minority groups, and given the fact that it is the white working classes who have the lowest achievement, they might have a point. Old Wars – e.g. WII – based around an alliance of Nation States involving the whole might of the nation in producing heavy scale military machinery (tanks/ fighter jets) and hundreds of thousands of troops. The global shadow economy – refers to the illegal trade in the trafficking or arms, drugs and diamonds. The U.S. War on Iraq (2003) demonstrates how the West continue to use war to secure resources, just like in Colonial times according to Dependency Theory. Paul Collier – Bottom Billion Theory – ethnic conflict, corruption, the resource curse – all linked with underdevelopment and conflict – e.g. Liberia/ Democratic Republic of Congo. Noam Chomsky – The United States is the ‘world’s biggest terrorist’, based on its mostly illegal interventions in 50 countries since WWII – e.g. practically every Latin and South American country. David Harvey – The war on Iraq was all about securing oil for the benefit of American consumers. Modernisation Theory – there is less conflict in wealthy countries – people have more to lose, thus tend to sort out differences peacefully. Dependency Theory – developed nations mainly drive war and conflict in conjunction with arms companies such as BAE systems. Feminism – most wars are fueled by male aggression: governments, arms companies, and armies are predominantly male institutions. Direct effects of war – include immediate effects such as higher death rates and the destruction of infrastructure. Indirect effects of war – include the longer term effects such as displacement of people (refugees), and the destruction of the social fabric, and poverty. Ending conflict as the primary development goal – conflict costs the global economy $13 trillion a year. It can send every other aspect of development (health/ education etc.) into reverse. The Global Peace Index – measures the level of peacefulness in over 100 countries using over 20 indicators including number of battle deaths, number of terrorist incidents, arms expenditure and so on. War, Conflict and Development – Test Yourself on Quizlet! Rwanda makes an interesting case study of a developing nation which appears to have atypically high levels of gender equality. It ranks no 7 in the Gender Empowerment Index, just behind the Nordic countries, and actually has a higher proportion of girls enrolled in education than boys (97% compared to 95%). Given that East and North African nations typically have the lowest levels of gender equality in the world (take neighbouring DRC as an example, Rwanda not only bucks the regional trend, but it also bucks the general trend of the correlation between higher GDP and greater levels of gender equality. So what’s its secret? I’m not exactly an expert in Rwandan history, but here are five things which might explain the high reported levels of gender equality in Rwanda. Firstly, the genocide, may have (somewhat perversely) played a role in female empowerment. In the aftermath of the genocide, Rwanda found itself a country composed of 70 percent women. The violence had been perpetrated by — and largely toward — men. There were simply fewer men due to death, imprisonment, and flight. Killings also targeted civic leaders during the genocide. Out of more than 780 judges nationwide, only 20 survived the violence. Not 20 percent, 20 total. These skewed demographics resulted in a power vacuum. Prior to 1994, women only held between 10 and 15 percent of seats in Parliament. Out of sheer necessity, and a desire to rebuild their country, women stepped up as leaders in every realm of the nation, including politics. Secondly – (and no doubt related to the above) women’s rights have been rooted in the constitution for over a decade – The constitution stipulates that at least 30% of government positions should be filled by women. Rwanda now tops global league tables for the percentage of female parliamentarians. Fewer than 22% of MPs worldwide are women; in Rwanda, almost 64% are. Fifthly, there is the role of women’s support groups in rebuilding the country after the decimation caused by the genocide. These groups initially just offered a place for women to talk about their experiences of being widowed and raped, but they morphed into workers co-operatives, which has, 20 years later, led on to a very high degree of engagement with women in local politics, which is increasingly integrated with national politics. Limitations of Rwanda’s Gender Equality…. As with all statistics, they don’t tell the full picture, one of the posts below makes the following cautions – Firstly, 60% of Rwandans live below the poverty line, and while those women how have jobs in politics and education are on decent wages, there aren’t actually that many people in the population employed in these sectors and gender equality means very little to the vast majority of women when they can’t afford to eat. Secondly, DV statistics don’t make for pretty reading, with 2/5 women saying they have experienced domestic violence, with 1/5 saying they have experienced sexual violence – And you can imagine how low the prosecution rate of men is for such crimes. A few thoughts on the meaning of all this…. Rwanda has experienced excellent economic growth compared to countries in Sub-Saharan Africa, which suggests that Gender Empowerment has a positive effect on development, but obviously this conclusion has to be treated with caution because there are so many other variables which need to be taken into account. If it is indeed the prevalence of women and the absence of (certain types of?) men from a society which encourages development, there are some pretty challenging implications – Most obviously it raises the question of how we are to reduce (certain types of) male influence in developing countries? Selecting a sample is the process of finding and choosing the people who are going to be the target of your research. Most researchers will have a ‘target population’ in mind before conducting research. The target population consists of those people who have the characteristics of the sample you wish to study. If you’re interested in conducting primary research on the experiences of working class school children in 2017 (or whatever year we’re currently in! ), then your target population would be all working class school children. Many researchers use a sampling frame to choose a sample, which is simply a list from which a sample is chosen – this might be a register of all pupils in a school, if you are conducting research in a school, for example. Positivist researchers want to make sure their research is representative – research is representative if the characteristics of the people in the sample (the people who are actually researched) reflect the characteristics of the target population. Random sampling – an example of random sampling would be picking names out of a hat. In random sampling everyone in the population has the same chance of getting chosen. This is easy because it is quick and can even be performed by a computer. However, because it is down to chance you could end up with an unrepresentative sample, perhaps with one demographic being missed out. Systematic sampling – an example of a systematic sample would be picking every 10th person on a list or register. This carries the same risk of being unrepresentative as random sampling as, for example, every 10th person could be a girl. Snowball sampling – With this method, researchers might find a few participants, and then ask them to find participants themselves and so on. This is useful when a sample is difficult to obtain. For example Laurie Taylor used this method when investigating criminals. It would be difficult for him to find a sample as he didn’t know many criminals; however these criminals know a lot of people who would be willing to participate, so it is more efficient to use the snowball method.